A new tram line has opened in Florence, connecting the airport and the city center at Piazza dell’Unità near Santa Maria Novella Central Station in 22 minutes. 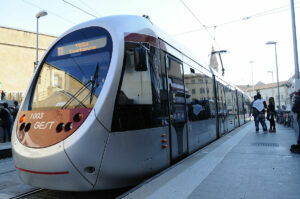 The T2 line is the second tram line to open in Florence and has 12 stops. The T1 line opened in 2010 and links Villa Costanza with Careggi in the northern outskirts of Florence, passing through Santa Maria Novella along the way. Tickets are good for 90 minutes and cost 1.50€. Passengers must buy a ticket from a bar, newspaper stand or tabacchi (cigar shop), and validate the ticket by punching it in the machine on board the tram. Service runs from 5 a.m. to 12:30 a.m. Sunday through Thursday, and 5 a.m. to 2 a.m. on Friday and Saturday. Florence eventually plans to open a third tram line to serve the western part of the city, but construction on that line has not yet begun. Thanks for the update! Really useful information!